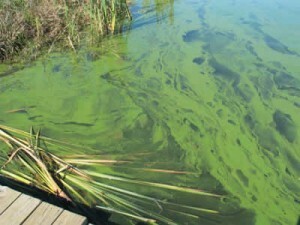 Microscopic blue-green algae or cyanobacteria are a natural part of the ecology of our lakes, but when they bloom – multiplying by the billions – they can form a toxic soup. The conditions that trigger such blooms are forecast to become a more-frequent occurrence in Okanagan lakes. Increased development, and the resulting nutrients (e.g. fertilizer) are one of the causes of sudden excessive algae growth—which occurs under the right conditions of light, temperature, nutrients and pH. 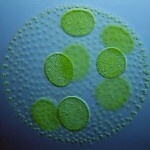 Certain species of algae produce toxins that can cause death within 20 minutes of ingestion. Cattle and domestic pets are particularly vulnerable because they’re less fussy about water colour and odour, but humans can also experience a range of symptoms from skin irritation to paralysis from exposure. Provincial legislation requires that drinking water be safe, with a rigorous testing procedure. Interior Health water specialist Rob Birtles notes public beaches are tested regularly for E. coli. But for algal bloom, the process of identifying a bloom near a beach and having it tested is a work in progress. However, if toxic algal blooms are identified near a beach, the beach may be closed. At the request of the Okanagan Basin Water Board following a cyanobacteria bloom in Osoyoos Lake in 2013, the Province of BC has produced the Protocol for communities to respond to blue green algae blooms. To report a suspected bloom, use the RAPP line. Birtles noted there were blooms reported on high elevation lakes in 2014, one on Chain Lake, out of Summerland, and another at Hatheume Lake, off the Okanagan Connector, west of West Kelowna. Only the Hatheume Lake bloom was known to be a toxic species. According to Birtles, Interior Health has provided feedback to the Ministry of Health on their draft risk assessment tool for identifying and assessing algal blooms. Birtles states that separate protocols for recreational water and drinking water should include a list of consultants and labs that provide assessment and lab analysis, as well as a standard template for public advisories. Blue-green algae, a very primitive form of aquatic plant, can acquire nitrogen from the air and their growth is often triggered by phosphorus pollution coupled with stable weather and warm water temperatures. The one-celled organisms divide rapidly, forming a noxious, pea soup or oil slick appearance on the water. Wind or wave action can disperse the bloom. Only certain species produce toxins, but it’s not possible to identify them by sight, so lab tests are necessary. Local aquatic biologist Heather Larratt says cyanobacteria are on the increase across Canada, but they have existed for as long as we know in Okanagan Lake. She has identified 13 different species in the valley’s water, some of which can adversely affect drinking water. Few Okanagan utilities could continue normal water delivery if their primary water source was affected by a toxic bloom near their water intake, she added. She says 39 of the 163 intake samples she has taken exceeded the 2,000 cells per mL threshold of concern, but none exceeded the 15,000 mL threshold of toxin threat. Intakes near outfalls, creeks or urban areas had higher algae counts than others. Spring counts were higher at shallower intakes with a depth less than 16 metres. Numbers increased again in fall. Ms. Larratt suggests everyone can help with prevention by not overwatering lawns, which can carry nitrates into storm water drains, then into the lake, feeding cyanobacteria. Local farmers can assist by having an environmental farm plan that addresses nutrient management. Not all algal blooms are toxic. In fact, only about 5% of blue green algal blooms produce toxins. Decision Protocols for Cyanobacterial toxins in B.C.